Today brings us to the last investment article for Magic Origins, Multicolor and Land cards. I’ve had rather bad luck with multicolor cards since Khans of Tarkir came out, and this is mostly because of how quickly the metagame has changed. Just because a Jeskai deck does well for 2-3 weeks doesn’t mean it will stay that way. What I’ve learned is that the prices of most cards are cyclical now. A cards price will go up for a few weeks after putting up good results at a major event, go down when it gets hated out, and go up again when the deck gains natural advantage over the current popular deck that is weak against it. This is the purest form of rock, paper, scissors in the metagame that I can think of. Before, standard always seemed to be broken down into the best 2 decks, and you either played them and won or you didn’t and lost to those match ups. Decks like Abzan and GR currently seem to be infallible, but mono red, Jeskai, and other naturally strong decks against them will rise. This in turn is going to lead to some difficult predictions for both multicolor and lands this time around. Jeskai Ascendancy – Jeskai Ascendancy was a victim of a metagame swing. Combo is still playable, but people just forgot about it and decided to try something different. This is why the card lost half it’s value since last time. Mantis Rider – Just as with Ascendancy, this card has just been forgotten. It’s a great card and has shown up recently in Jeskai Tempo and burn decks. Another card that went down when I thought it would go up. Narset, Enlightened Master – Nobody is playing Jeskai control anymore thanks to cards like Crux of Fate and Languish, and with both being better than End Hostilities and Anger of Gods, I can understand why. Narset is going to be homeless for a while. Another call that lacked insight. Prophet of Kruphix – No change in the card yet, but I’ve noticed lots of people showing interest in it on Puca Trade over the last few weeks. Some people are saying it could be banned in EDH which is where most of its growth is predicted to be, but I’m staying optimistic. Not a bad call if you bought some at $1. Rakshasa Deathdealer – another card with no change. I didn’t say it would go up last time, just that it could easily become a staple. Siege Rhino – Before the Clash Pack printing, I had said to wait until it dipped to about $5 to get your copies, and I was correct on saying to do so. Xenagos, God of Revels – No change from the big guy. He’s still $4.50. I called it as a long term spec, so you’re still fine if you picked them up at $3-4. Chief of the Edge – BW warriors was easily eclipsed by goblins and elves which makes the Chief not really worth that much. No change from him. Chromanticore – Good call on saying to sell at $3. It’s down to $1.50 now. Khans Fetch Lands – Every fetchland has gone up from their previous $8-10 price tags, but it doesn’t take a rocket scientist to predict that. Probably my biggest win from last time. Urborg, Tomb of Yawgmoth – Urborg has actually gone down since last time due to the decrease in popularity of Abzan decks, but it’s only a matter of time before rotation. Not a bad call to pick them up at $9.25 last time. They’ve only dropped about $.50. Pain Lands – Thank GOD I said sell your Pain lands. Origins has erased any type of value these cards could ever have. Theros Temples – I said to wait on the Theros scry lands to spike, and to sell the others. Sound advice as they have all dropped in value. Nykthos, Shrine to Nyx – Nykthos was a sell at $6.50 last time, and it’s dropped a little to $5.50 so it was probably a good idea to sell. I’ll call it a win. 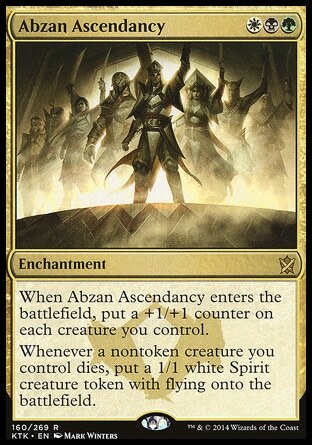 My first spec of the day is Abzan Ascendancy. The card recently showed up in a Modern deck using Return to the Ranks, Blood Artist, Cartel Aristocrat, and a number of other 2 drop creatures. The combo is simple: Play a sacrifice outlet, drain your opponent with Blood Artist, and then do it all again by convoking Return to the Ranks with all of the spirit tokens you receive from Ascendancy. It’s definitely a fringe deck, but it gives the card a deck which it recently didn’t have. 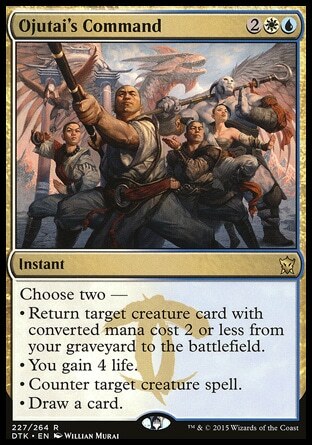 It might not happen right away, but this card could go from its current price of $.25 to $1-2 if the combo ends up being playable in standard as well. Not a bad spec. Get them for dirt cheap, and then buy list them later down the road for $1 each. Good for buying in bulk. I also kind of like Anafenza, the Foremost ($4) now just because it’s great against Abzan rally decks. If Abzan aggro, midrange, and control end up playing her in sideboards or main, that could push the price up. This all depends on how well Rally the Ancestor decks do in the coming weeks. Not a buy, but keep an eye on her. I’d also like to speculate on Deflecting Palm as a SB card for the upcoming Battle for Zendikar block. We know there are going to be huge Eldrazi as well as other creatures in that block, which means something that re-directs all that damage could see some play. Might not hurt to get 2-3 for a sideboard at $.50. Ashiok is another touchy card. There has been some play with it in modern sideboards, and being 3 mana makes is playable in any of those eternal formats . . . but I think it can still drop a few more dollars from $7. Look to get a couple if the price hits $5. GR Ramp decks have shown their dominance in standard again and again, and I believe that the deck will still be playable come rotation. See the Unwritten decks are going to be downright unfair this fall, and you can be sure Atarka will be in there. 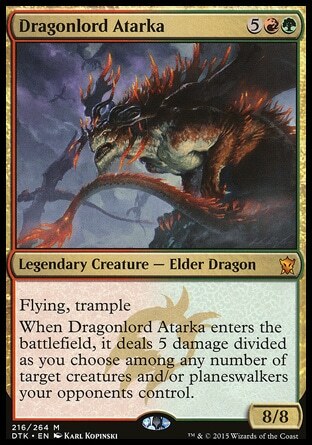 The only problem with Atarka is that it’s not a 4 of, not is it played in any other deck heavily aside from the 5 color dragon deck. There has been some play with it in eternal formats, but not a lot. $10 is still a deal though, and if you’ve been holding off getting 2-3 for a GR deck, NOW is the time to buy it. This could easily double up to $20 again I think. 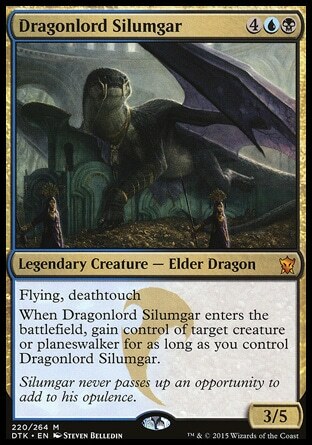 $6 for a Silumgar also seems like a great deal at the moment. The dragonlord only sees play in Esper and 5 color dragons at the moment, but it’s a solid card. I also think there will be some juicy targets for it in BFZ, which means picking up 1-2 at this price is probably a good idea. While it won’t become the core of a deck, it could see a lot of sideboard play in various decks. I think Dragonlord Dromoka could be another card worth picking up for your sideboard, as I don’t think it will go lower than its current $6-7 price while it’s in standard. Narset Transcendent isn’t your typical planeswalker, at least not for control. We’ve been spoiled by cards like Elspeth, Sun’s Champion which was THE defining planeswalker of 2014 and 2015. She was able to clear a board herself, as well as create an almost neverending army. Nissa, Worldwaker also showed her power well during Green devotion’s heyday, but where does Narset fit in? When spoiled, she was compared to Domri Rade and hopefully do for control what Domri did for creature decks. 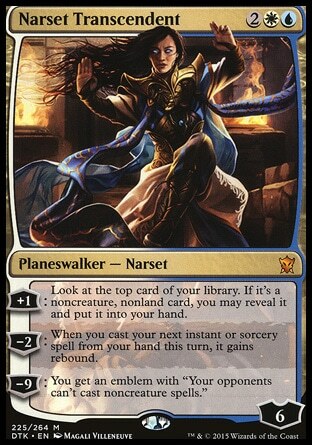 However, do we really want Narset in a an Esper or UW build? I’m not so sure. Recently it’s seen some play in UWR counter/burn decks here in Nagoya, which seems like a better home for her than getting card advantage for non-red decks (which really don’t need it consider all the card draw they have). Another deck I could see her in post rotation is UWR Tokens. At $9, I think she’s a good buy and would pick up 2-3 if you have some puca points laying around or can trade for them with friends. It won’t take much for her to shoot up in price again. I’m betting on her post rotation. All of the other commands (aside from Silumgar’s) has had their time in the sun, and I believe Ojutai’s Command ($2.25) is just around the corner. I was at it’s mercy first hand the other week against UW control. My opponent was playing the Command alongside Harbinger of the Tides, the new Jace, and Elspeth, Sun’s Champion. It was an amazing tempo play countering my spells, returning Harbinger to the battlefield to bounce my attackers and block another, then do it all again with Jace the following turn if he wanted to. It doesn’t really have the time to shine right now, but I think it will see a lot more play in control/tempo decks in the next few months. I just got my playset for $2 each, and I recommend you doing the same. Being a promo might stop the card from going too high, but we could see it at around $5 by the end of BFZ. I think Sidisi, Brood Tyrant might be another good spec at $1.50, just because of how good Delve/Dredge decks are. There are still lots of enables that can will your graveyard, and some amazing delve cards that have good synergy with it. I think it could see play alongside Liliana, Heretical Healer in the future. I don’t think you need a playset, but if you don’t have any right now, see if you can pick up 2-3 for $1 each. Urborg might drop another dollar or two before rotation from it’s current price of $9, but I think it’s a good pick up for a long term investment. This is a card you buy now and then sell a year later for double the profit. I wouldn’t buy a lot of them, but one or two might not be bad to have. 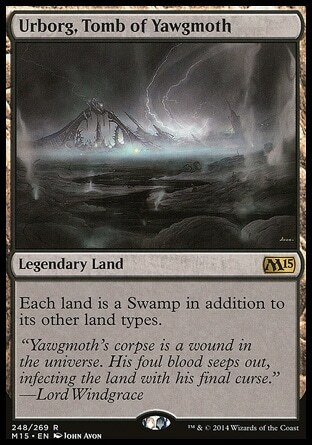 Nykthos, Shrine to Nyx ($5.50) is another card that could dip in price but that I would pick up 4 of. This card could have serious modern applications down the road, and if you can pick it up at $3-4 at rotation, I think you should. It’s a long term investment, but a good one. It’s painful to have to pay almost $20 for a Polluted Delta or Flooded Strand, but the longer you wait, the worse it’s going to get. These cards are only going to go up the longer you wait, and with the enemy fetchlands not coming this fall in Battle for Zendikar, fetches will become all the more important, especially when a deck becomes popular. Finish your playset now while you still have time. Sorry this last article took so long. My weekend was all about Magic Origins Game Day (article coming up soon), and the previous week I was busy with work and running errands. I think my choices are a little more conservative this time than they were before, yet I am still willing to take a risk on some cards that are long shots. What do you think? Any cards that I missed? Any you think I might have underestimated? I’d like to hear what you think is going to happen in Magic Origins standard, and if you have any other suggestions feel free to post them in the comment section down below! Thanks for reading as always. See you next time.